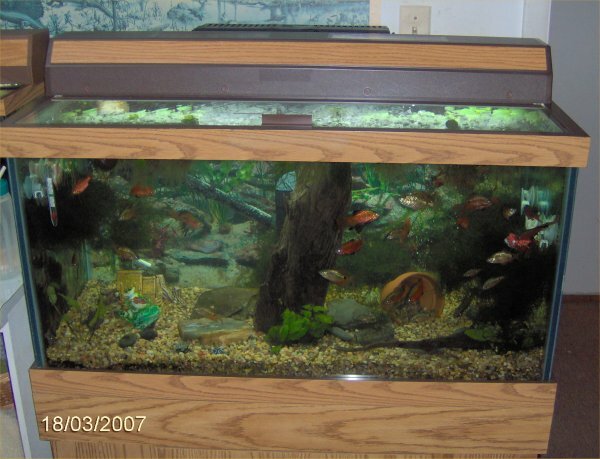 On 3/17/07, I redid the 50 gallon tank. Photo - 50 gallon tank before I started work on it. Photo - another of the 50 gallon tank before I started work on it. That makes a total of 39 rosy barbs. 22 are male, 16 are female, and 1 is a baby. 10 are long finned, 28 are short finned, and 1 is a baby. 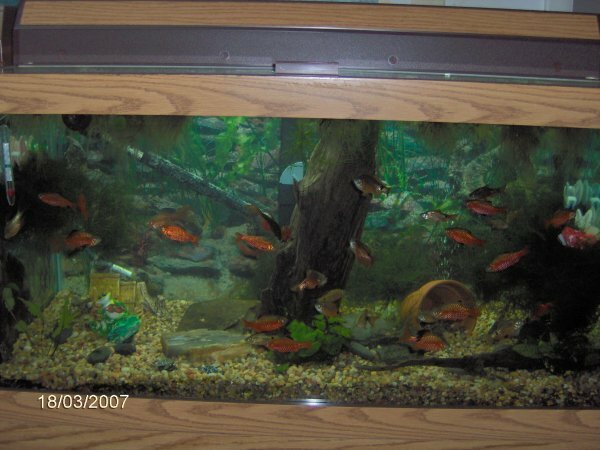 All those barbs came from my first pair that I added on 2/1/02 which was a male longfin and a female shortfin. I moved the panda cory to the 20 gallon tank to join the panda cory in there. They are my last two panda cories. 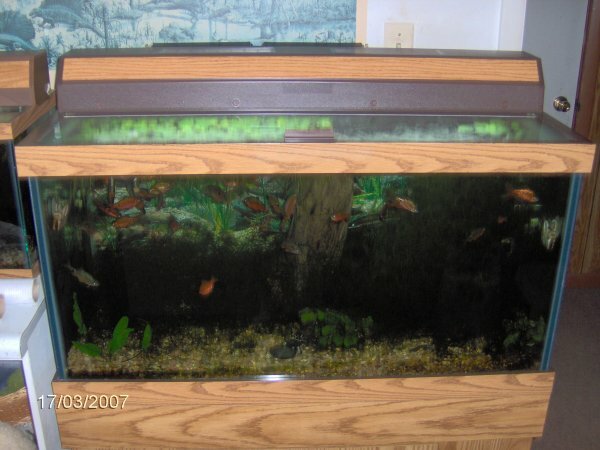 The "baby" in the 20 gallon had been there alone for three years. The adult was older and had probably been alone for half a year since the one before that died. The "baby" is in great condition. The adult has no whiskers, no mouth tube, damaged fins, and is only 2/3 of the size of the "baby." The adult has more dramatic black coloration so I think it is male, and the "baby" is female. At first, they ignored each other for a few hours but then became inseparable. 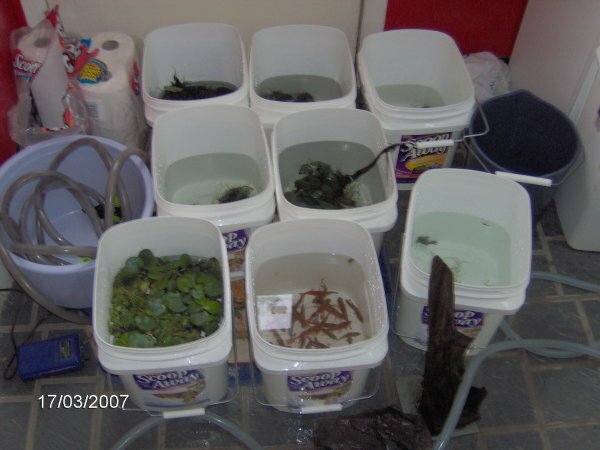 Photo - the eight buckets full of plants and fish. Each bucket holds about 2.5 gallons maximum (not all were full). The front left bucket is frogbit. 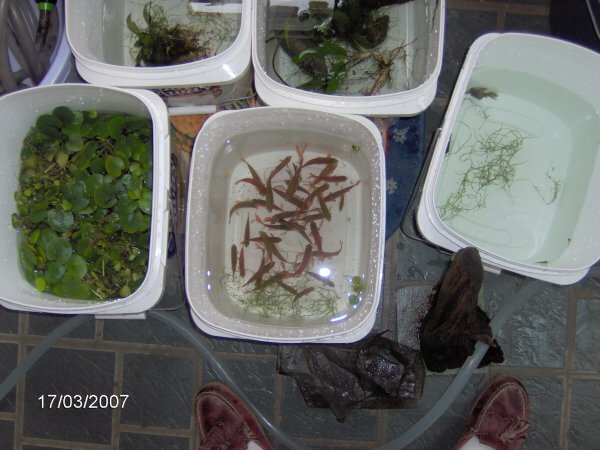 The front right bucket has most of the rosy barbs. Photo - a closer view of the front five buckets. Clockwise from the upper left are a few plants, a few plants and driftwood, the Queen Arabesque pleco with the otto and the rosy barb fry, most of the rosy barbs, and the frogbit. At the bottom of the photo is the driftwood, some slate, and my lovely house shoes. 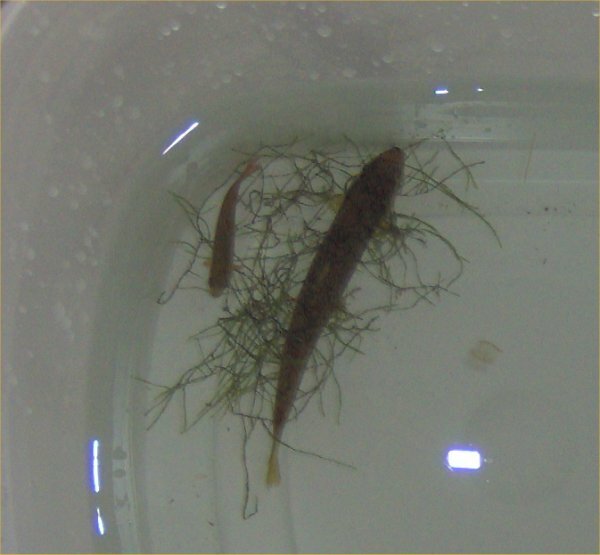 Photo - a close up of the bucket with the real Siamese algae eater and a rosy barb that was in there because it came out in the same net scoop. Photo - a close up (from left to right) of the bucket with the rosy barb fry, the otocinclus, and the Queen Arabesque pleco as well as a wee bit of java moss. 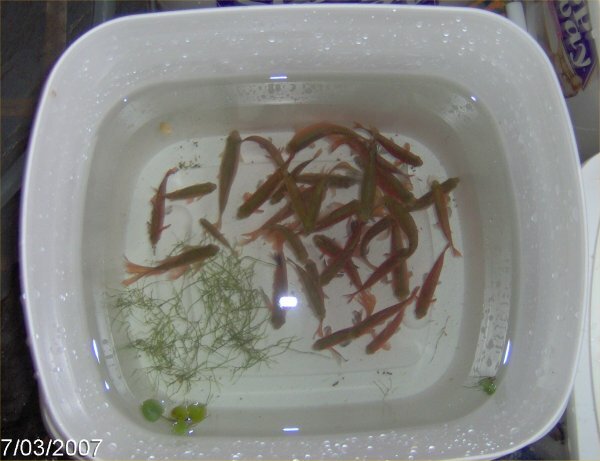 Photo - a close up of the bucket with the rosy barbs; 37 of the 39 rosy barbs were in there. Once the tank was empty of water (courtesy of the Python hose), I decided to remove the gravel since I could not get it clean in the tank. I picked up handfuls into the buckets, took them to the sink, rinsed them, and poured them into another bucket. 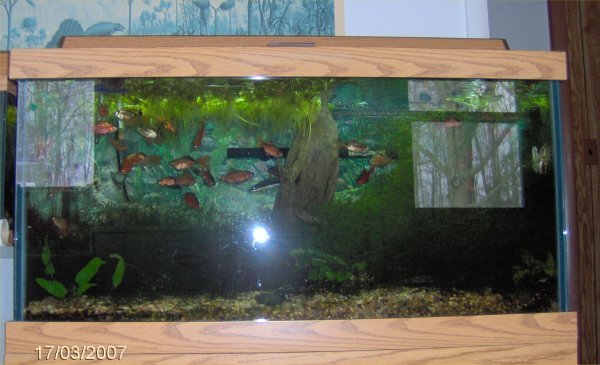 Once empty, my father and I moved the tank out about 1.5 inches. It was not hard to do that. I thought it would be. I scraped as much algae off the inside as I could. I rinsed the sides down and tried to use a turkey baster to remove the black stuff in the bottom but that was fruitless so I had to leave some. I put the gravel back. I set up the new Emperor 400 filter. I put in the heater. I cut new air line tubing (both for the main air pump and battery back up) and installed new check valves and got the aeration going. I filled the tank up halfway. Then, I put back all the non-living stuff like the driftwood, slate, new thermometer, and ornaments. I bailed back the buckets of water that did not have fish in them. Once they were in, I bailed in the buckets with fish. After all the buckets were in, I topped off the tank, filled up the filter, and plugged in the filter and heater. The water was cloudy. I added aquarium salt, Stress-Coat, Stress-Zyme, BZT, and later some pond AccuClear to help clear the water. I stuck the old biowheels from the Magnum 350 Pro into the Emperor 400 filter next to the carbon. The wheels are smaller on the new filter so I had to pull the pleats off of the holder and fold them like an accordion to stick them into the new filter. I used Windex on the outside of the tank. I set up parts of the old filter and stuff into buckets of dilute bleach to soak (I bleach soak, fresh water with dechlorinator soak, air dry, and put stuff up for storage if at all possible). I then cleaned and put back all the stuff from under the cabinet. Total time - almost four hours. Photo - 50 gallon tank a few hours if it was done with the renovation. It was a little cloudy. 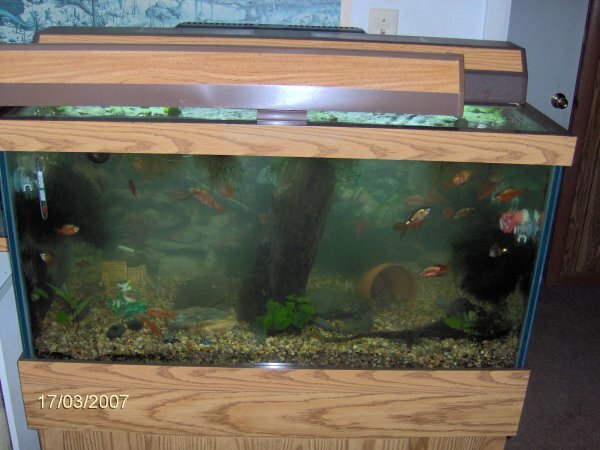 Photo - 50 gallon tank the next day, 3/18/07. Because the 50 gallon tank was now out another 1.5" without hoses from the Magnum 350 in the way, the next day, 3/18/07, I vacuumed behind the tank for the first time since 1996! Something got stuck in the crevice tool. 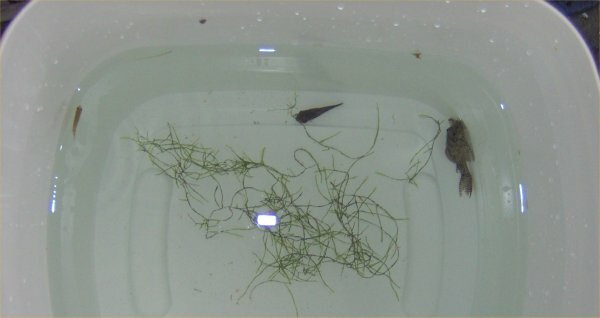 It was one of my missing African dwarf frogs from my 20 gallon tank! He was mummified after probably 6-18 months back there. I am not sure when he jumped ship.